A new £3.5m local transport pot for South Yorkshire will fund projects in Barnsley, Rotherham and Doncaster, but not Sheffield. Members of the Sheffield City Region Combined Authority (CA) recently approved the creation of the pot as existing funding streams come to an end. The decision to exclude Sheffield projects led to Cllr. Julie Dore, leader of Sheffield Council, questioning the rationale of the scheme and worries if it sets precedent for how other funding sources might be allocated. The move appears to be the latest rift in the Sheffield city region (SCR) where issues such as HS2, devolution and paying for the Sheffield Supertram have caused splits between the four South Yorkshire authorities. As other sources of funding come to an end, local authority leaders agreed that a decision be made for the CA to borrow £3.5m in order to create a local transport fund. It would see funds split on a per-capita basis with Barnsley Council set to be apportioned £1,042,886, with Doncaster earmarked for £1,324,682 and Rotherham set for £1,132,432. Sheffield has not been allocated any of the £3.5m. In Rotherham, the the apportioned cash is to be used to contribute to A631 traffic management improvements; A57 Anston Crossroads upgrading and improvement; A630/A631 Rotherway roundabout traffic flow metering and enhanced pedestrian facilities in Rotherham town centre. Minutes from the meeting of the CA show that Cllr. Dore "questioned the rationale of this pot and asked why, as a South Yorkshire badged initiative, it is only available to three of the four districts." 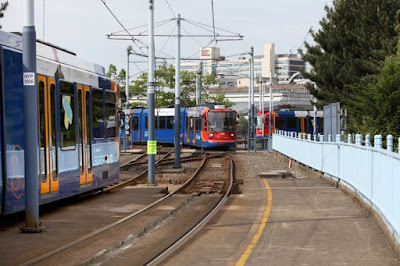 Officers suggested this arises from the identification of a large discrepancy in the amount of borrowing being invested in the Supertram network in Sheffield and the amount of borrowing being used to support projects in the other three districts. The minutes add that Cllr. Dore asserted the Supertram network is not only used by residents of Sheffield. Rothbiz reported in 2014 that the South Yorkshire Passenger Transport Executive (SYPTE) still had a deficit of £30.5m on its general reserve budget with a significant part of this relating to capital expenditure incurred by the PTE as part of the construction of the Sheffield tram network. The transport authority approved proposals to borrow funding and make a £30.5m capital grant to the SYPTE to cover the deficit with the aim of reducing the levies that councils pay each year. In addition, a rail replacement scheme is entering its second phase. Following a £20m first phase, £12.5m has been set aside for phase two which is proposed to take place over the summers of 2018 and 2019. The minutes also show that Cllr Dore. asked if this sets a precedent for how other funding sources might be allocated between partners going forward but officers noted there are no current plans to repeat this exercise. The four authorities continue to pay an annual levy to cover the costs of the SYPTE which uses funding in the provision of public transport services and facilities. It has a annual budget of around £65m. Cllr. Dore also requested a recorded vote be taken in respect of the recommendations. Cllr. Sir Steve Houghton, leader of Barnsley Council; Ros Jones, Mayor of Doncaster; and Cllr. Chris Read, leader of Rotherham Council all voted for the creation of the £3.5m pot. Cllr. Dore voted against.